Found 2 file extension associations related to CUEcards 2000 and 2 file formats developed specifically for use with CUEcards 2000. 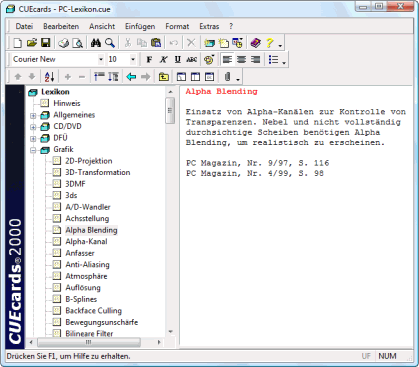 With CUE cards can be a large number of short text fragments structured in a file together. All entries are arranged in a tree and can be arranged at any time by full-text search recovered. The application is ideal for building and maintaining collections of knowledge of all sorts, such as tips Collections & tricks, support databases, documentation, etc. - or simply as an electronic slip box. CUE cards combines a simple but powerful concept with a clear and simple operation. If you need more information please contact the developers of CUEcards 2000 (Marcus Humann), or check out their product website.